China’s energy storage market saw a boost of policy support in 2017, from the release of the first national-level policy on energy storage—the Guiding Opinions on Promoting Energy Storage Technology and Industry Development—as well as regional energy storage policies such as those released in Jiangsu province, China Southern Grid, and others. According to the CNESA research department’s domestic energy storage market tracking, the first half of 2018 saw the announcement of new energy storage project construction in Jiangsu, Henan, Qinghai, and Guangdong provinces. These projects varied in scale from tens of megawatts to hundreds, and altogether totaled 340.5MW (including those projects planned, under construction, and already operational). This combined new capacity nearly equaled the country’s total accumulated operational capacity of 389.4MW at the end of 2017 (source: CNESA Global Energy Storage Database). Thus far, 2018’s newly operational capacity has already achieved growth 281% higher than that of the entire 2017 year. If the entirety of this new capacity begins operation on schedule, China’s domestic energy storage market will see an amount of growth that will make 2018 one of the most significant years yet for the industry. When it comes to electricity, Jiangsu, Henan, Qinghai, and Guangdong provinces differ in a variety of ways, including power structure, power consumption, electricity pricing, distribution of resources, and policy support. Such differences have naturally influenced the ways in which these provinces have implemented energy storage. In response to Jiangsu province’s supply-side structure reforms and to implement the province’s “263 plan,” three generators of the Jianbi power station--totaling 33,000 kW--were shut down in 2017, having reached their age limits1. The Jianbi power station provides power to Danyang, Yangzhong, Zhenjiang New District, and other regions of eastern Zhenjiang. The shutdown of these generators left this area with a significant power shortage. With summer loads increasing each year, the eastern region was faced with unprecedented peak load pressure this summer. In light of these challenges, in May of 2018, State Grid Jiangsu Energy Service Co., Xuxu Group, and Shandong Electric together initiated plans for the construction of large scale grid-side and behind-the-meter storage projects in eastern Zhenjiang. The projects capitalized on energy storage’s short construction period, flexible deployment, rapid response time, and other advantages to effectively reduce pressure on the grid. Grid-side projects included eight energy storage power stations equipped with lithium iron phosphate batteries at a total scale of 101MW/202MWh. Providers include ZTT Energy Storage, CLOU, eTrust, and other domestic companies. Behind-the-meter storage has largely been supplied by Narada’s lead-carbon batteries at a total capacity exceeding 500MWh. Henan is one of central China’s major provincial power consumers. The province possessed 66,570 MW of thermal generation capacity at the end of 2017, the fifth largest in the country. To better adapt to new energy trends and promote the transition to new energy systems, Henan province released two policies in 2017, the Henan Province Energy Development Program for the “Thirteenth Five-Year Plan” and the Henan Province Development Plan for the Energy Transition. These policies highlight the use of renewables in the next generation of energy development, avoiding fossil fuels and promoting the construction of wind power projects and greater exploitation of solar power. The policies also explore the creation of ancillary service markets, encourage increased investment in grid infrastructure, and show support for the development of a national electricity spot market. Energy storage in Henan province has great development potential in wind power, integrated solar, frequency regulation, peak shaving, and T&D deferral. In the second quarter of this year, Henan Grid experimented with its first megawatt scale grid-side battery storage project. The project is currently Henan’s largest battery storage project, as well as one of China State Grid’s three largest storage projects of the 2017 year. The project is spread across 16 substations in 9 regions and can be charged during non-peak hours and release energy during peak periods. The project also provides stability for wind and solar power and increases the efficiency of grid operations. So far, two calls for bids have been announced, calling for capacity of 90MW/90MWh. Companies including Lishen, Narada, and CLOU have submitted bids. Of these bids, the Huanglong substation and Longshan substation projects have already begun operations. Qinghai possesses plentiful solar and wind resources with great potential for development. Solar energy provides a potential 3 billion kilowatts of power, while wind resources provide a potential 75 million kilowatts. Solar power has already become the second largest source of electricity in Qinghai, after hydroelectric power. However, the large-scale addition of these resources to the grid has also brought safety and stability concerns, wind/solar curtailment issues, and problems related to the coordination of multiple clean energy resources. Energy storage can help combat these problems by serving as a supporting technology, with enormous development potential for renewable integration, solar and wind curtailment reduction, frequency regulation/ancillary services, and other applications. Huanghe Hydropower has been a leader in the clean energy industry. The company’s efforts to develop diversified models for clean energy and create large-scale solar and wind power stations have also begun to include energy storage. In June of this year, Huanghe Hydropower’s 1000 MW combined hydro-solar-wind demonstration project successfully connected to the power grid. The project also included a 20MW/16.7MWh energy storage component. In addition, Huanghe Hydropower has recently released calls for bids for energy storage support for 45 thousand kilowatts of wind power in Gonghe county and 10 thousand kilowatts of wind power in Wulan county. The company has called for 45MW/90MWh and 10MW/20MWh of energy storage capacity, respectively. The projects will rely on a variety of storage technologies, including lithium iron phosphate batteries, lithium ion batteries, zinc bromine flow batteries, and vanadium flow batteries. Shanxi has consistently lead the way in China’s combined “thermal power plus storage” frequency regulation model. By the end of 2017, Shanxi had initiated a total of three thermal power plus storage frequency regulation projects, the only operational projects of their type in China at the time. Two of the projects were developed by Ray Power and one was developed by CLOU. The total storage capacity of the three projects equaled 9MW/4.5MWh. Apart from Shanxi, Inner Mongolia and Hebei also began involvement in thermal power plus storage frequency regulation projects, the largest of which was CLOU’s 18MW/9MWh frequency regulation storage project in Inner Mongolia. The combined thermal plant generator and energy storage system provides frequency regulation services, improving the frequency regulation capabilities of the thermal generator, reducing the risk of receiving penalties, and providing financial benefit to the plant. Starting in Guangdong province, China Southern Grid has begun experimenting with power market reforms, including reforms to the ancillary services market. Southern Grid has released the Guangdong Frequency Regulation Market Transaction Regulations (Trial) and begun trial operations, allowing third party ancillary services providers and generation companies to take part in the ancillary services market. In the second quarter of this year, following Shanxi, Inner Mongolia, and Hebei provinces, Guangdong announced four “thermal power plant plus energy storage” combined frequency regulation projects at a combined capacity of 57MW/28.5MWh. The largest of these plants is the CLOU project at the China Resources Power plant in Haifeng with a capacity of 30MW/15MWh. Guangdong has become the first China Southern Grid region and the fourth province nationwide to develop a combined thermal power plant and energy storage frequency regulation project. Storage projects in the four provinces above have been noteworthy for their harnessing of a variety of energy storage technologies, including lithium ion batteries, lithium iron phosphate batteries, lead carbon batteries, vanadium flow batteries, and zinc bromine flow batteries. 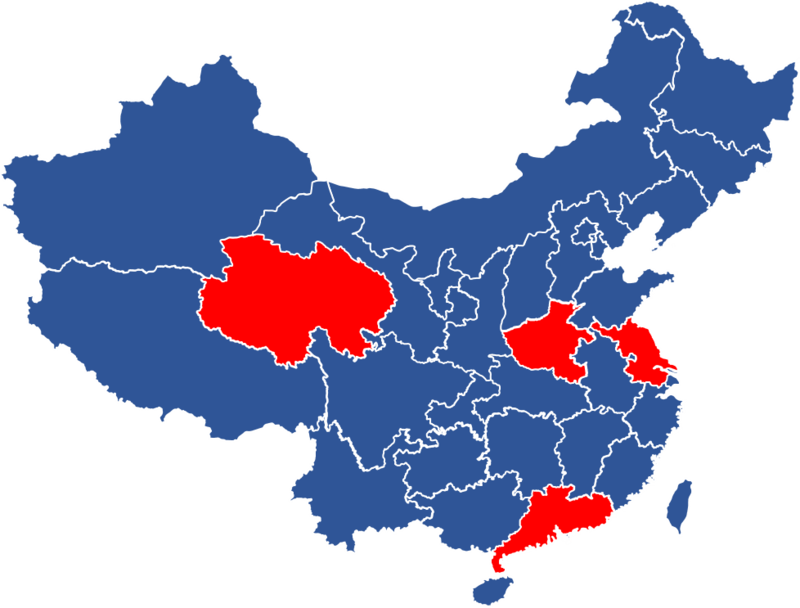 In addition, apart from the typical energy storage applications in renewable integration, frequency regulation, and behind-the-meter applications, Jiangsu and Henan provinces were the first in the nation to release 100 megawatt level grid-side projects, providing promise for future large-scale grid-side projects in other regions and perhaps nationwide. The Jiangsu and Henan grid-side applications also exemplify the role of grid companies as key users of energy storage technologies. Although market mechanisms are still taking shape and the full value of energy storage applications have not yet been recognized, enthusiasm from grid companies is a positive signal providing energy storage companies with confidence. At the same time, these projects also provide a variety of real-life data for market regulation policymakers, providing support for the growth of the energy storage market across the country. 1The “263 Plan” is an initiative implemented by the Jiangsu provincial government and Suzhou city government to meet the central government’s environmental protection requirements and promote the construction of practical and environmentally friendly infrastructure.